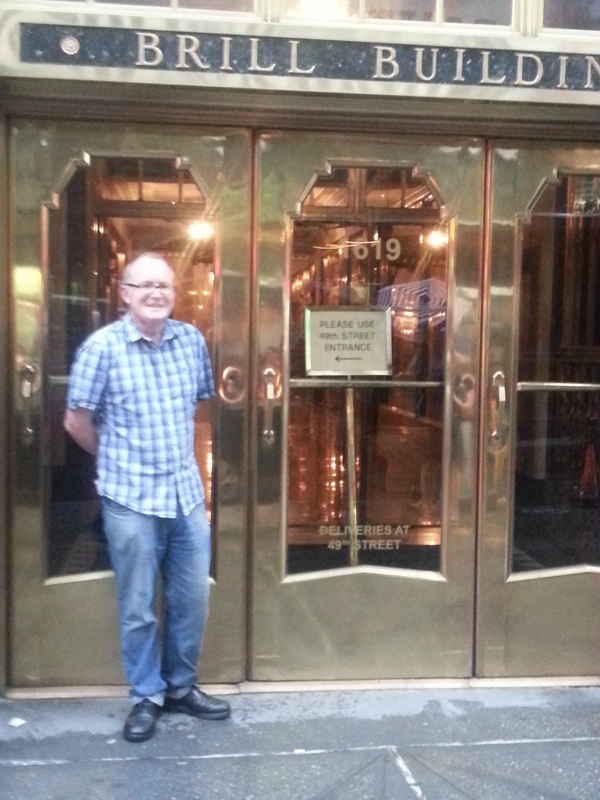 A recent trip to New York saw us visit the Brill Building. My husband Mr BG is a musician and songwriter and visiting the building in which some of the 20th century’s most significant songwriter plied their trade was pretty special. It was a quick snap, taken in between pedestrians hurrying home, and in between rain showers. It’s also quite a rare snap as he doesn’t grin so widely :). When I think of doors, I think of those that open and show you an opportunity that you may never have known would exist. Heading to the United States this year was one such door, and seeing how happy he is, I am so glad we went through. Windows are not so much something you walk through, but look from, or into. 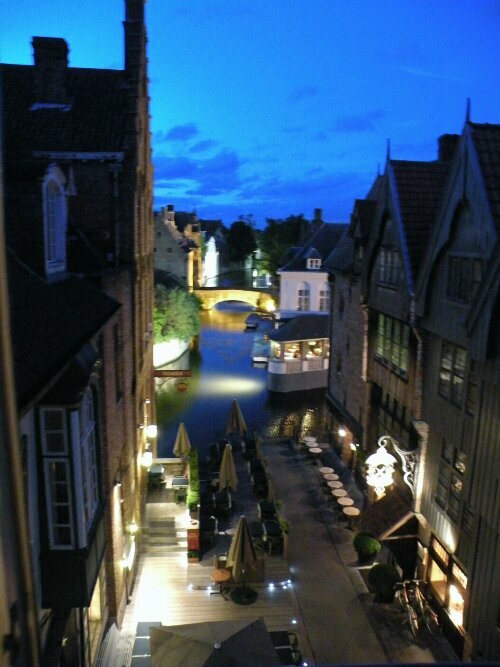 This was my view from a hotel room in Bruges in July 2012. The canal, the bridge, the architecture- I know I’m not in Ballarat anymore. I could sit at our window at any time of the day and see people sitting having a coffee, tourists taking photos, boats on the canal, and people walking or biking over the bridge. Why have a TV if you have a window and a view like this? At first I was pretty annoyed by someone who had been to a range of marvellous places and dismissed them because they were too commercial (Machu Picchu), or too cold (Times Square New Year’s Eve), or too empty (the Taj Mahal is apparently a tomb). Then I realised it to be link bait and designed to spark debate. So rather than present my places I would avoid like the plague, I present 7 things I have learned from travel. 1. Do your research. A bit of a no-brainer, and considering the wealth of information in online travel sites, travel guides, and travel agents, it’s not that hard. The key to doing research is to do it early, and assess whether or not you really want to go to a particular place. 3. Bring some common sense- of course it will be cold in Times Square on New Years Eve and there will be no toilets. It will also be cold in Scotland at any time of the year, even in August. It will rain in Ireland 9 days out of 10. Double-checking time train times and platforms is normal. You go to the toilet when there is a toilet, not when you need to go. 4. Travel is a matter of personal taste- My parents have visited China several times and love it. I couldn’t think of any other place I would rather not go to, except the airport in Dubai which is my personal HELL ON EARTH. Mind you, we have visited various Scottish islands, including Lewis, Skye and Orkney and parts of Western Ireland to look at Neolithic monuments, which wouldn’t exactly be everyone’s idea of a fun holiday. 5. Have a backup- printout confirmation emails, maps, receipts, for when you don’t have online access. Also have a backup payment facility for when your credit card gets cancelled, like mine did after I used it at Heathrow airport. 7. Be open to new experiences. I didn’t think I would enjoy travelling by train as much as I did. I didn’t think I would enjoy playing Uno with the kids as much as I did. I didn’t think I would love Bruges and York, and walking in the moors of Derbyshire. What things have you learned from travelling? I would love to know! Sometimes there can only be so many photos you can take of historic monuments when you go overseas. Sometimes the more interesting aspects of a city can be the things people walk past and don’t notice. Opposite the Colosseum in Roma, two ladies are resting, totally oblivious to the knight riding a bicycle. Yoda striking a pose in the Piazza del Popolo, Roma, with Miss BG. It’s not a hat. ‘An elephant in a boa’ A stencil on a wall in Montmartre, Paris which is a lovely reminder of one of my favourite books The Little Prince. Welcome to the Bookgrrl Travel Awards, where I give my stamp of approval, or a kick in the pants to the places we visited. So drumroll… the award goes to the Bourgoensch Hof in Bruges, where we were awarded views of the canal, and bridges, and people strolling and riding their bicycles. An honourable mention to our house in Skye, where you could see the sheep on rolling hills, the sea, and ‘our’ mountain whose mood changed from minute to minute. It does not go to the Bayview hotel in Portballintrae, which heralded its view of Bushmills, which turned out to be a view of… the carpark. The ‘Pinch me now, I can’t believe we’re here’ award goes to the place where the sudden reality of where you are just smacks you in the face. That award goes to coming out of the Colosseo station in Rome to be greeted by the Colosseum! The ‘Can’t swing a cat’ goes to the smallest accommodation we encountered on our stay. It is awarded to the Premier Inn in Islington, which was a standard room, with a couch made up and a trundle bed set up to make it a ‘family room’. There was no space between all three beds, and if you wanted to move about the room, the rest of the family had to be sitting on the beds. The bathroom was palatial compared to the bedroom. The ‘Brady Bunch’ award goes to the accommodation which was the most family-friendly. This involved much deliberation with everyone in the family, with a winner and 2 honourable mentions the result. Our flat in Highbury/Islington in London was a clear winner. There was a backyard, the playground across the road and there was also ‘no big stairs like there were in Florence and Edinburgh’ as Master BG said. There were also kids to play with, the Tube and bus stops 50m away, as well as a supermarket. The honourable mentions went to our flat in York, which had a well-stocked toy cupboard and kids books available,and also had a WII, which, being an absolute numpty, I couldn’t get to work. The second honourable mention went to Skye, as chosen by the kids. They loved the cottage as it had stairs (only one flight), they had a room of their own, and a garden in which to play. There were also lots of sheep to look at. The “If only we could come back without kids” award goes to the best hotel room. That award goes to the Grand Central Hotel in Glasgow, which is attached to Grand Central Station and has recently been refurbished. The beds were king-sized, with plasma TVs, the room was huge and the bathroom had a heater behind the mirror, so it would not fog up when you were in the shower. They also win the ‘Scrumptious’ award for the best meal we had. I would have liked to give an award for the most friendly hosts, but there were so many it is hard to pick out a winner. Everyone was incredibly nice, but these are the standouts. I have linked to them because I want to spread the love for any aspiring traveller. Gaia of the Casa Valadier in Rome, for her card and wine, and very comprehensive list of where to find everything in Rome. She really set a high standard! The staff at the Loch Erisort Innon Lewis for getting a waitress to wear an Aussie rugby jumper to make us feel at home, and for sending in a sticky date pudding with a candle for Mr BG to celebrate his birthday. Howard and Ros in Stanton Lees, Derbyshire for feeling more like friendly neighbours whom you could pop in and ask for anything. That’s it- I just have to go back. It has been a week since we tumbled out of the taxi in front of chez Bookgrrl. There is nothing like a long plane trip and returning to winter in Ballarat to take the gloss off the holiday. The jet lag and sleep deprivation can also lead to feeling and being quite weepy about not being in London, or Rome, or Paris anymore. But what has been really heartening is everyone is glad to see you and wants to catch up with you! There is another topic of conversation other than how cold/wet/miserable/dark it is in Ballarat :). Master BG regaled the class with reading from his journal, painstakingly written over the holiday. It was a good aide-memoire, and he used it as a launching pad to expand on his entries. Miss BG brought some photos in and was able to show her friends and teachers her adventures. I got a quick kiss goodbye, rather than the clinging limpet I usually get, she was so engrossed in telling her stories. Mr BG was welcomed back to over a thousand emails, and handed over the obligatory duty-free chocolate present to the staff. I have also taken to switching off. Rather than leave appliances on standby, the telly, toaster, kettle and microwave get turned off at the switch when not in use. Rather than leave the computer on all day, I turn it off when I no longer need it. I am also reducing my time spent online. The enforced absence from being constantly connected is something I want to maintain. It doesn’t do me nor my family any good to be relating to a screen rather than to other people. And I am reading more, trying to finishing my granny square blanket and getting to know my new niece. There are untold pleasures to be had at home :). I wasn’t looking forward to the holiday ending, because it meant I had to go on a plane for up to 24 hours to fly home. 24 hours of sitting having the person in front recline their seat into my face the seond the seatbelt sign is turned off, 24 hours of bitchy single women of a certain age look disapproving at every child, including mine (whom may I add were angels), 24 hours of crappy food, and 24 hours of not being able to sleep properly next to twitching children. I was lucky to have gotten about 2 hours during the flight and when that was combined with waking early the last day we were in London, with a night flight, delays in Dubai it meant I was nearing 48 hours with hardly any sleep when we finally arrived in Melbourne on Wednesday morning. The coldness of the airport kept me awake (no more overheated indoors in Australia- Yes!) as we hit the duty-free. We grabbed our duty-free alcohol, and joined the queues in Customs. There had been a few international flights arrive at the same time as ours, it the hall was packed. I was stressing that we wouldn’t make our connecting bus back to Ballarat as we joined the lengthy queue for those who had children or who did not have an ePassport. The silver lining for the queueuing was that at least our bags would be on the carousel waiting for us. We wait a couple of minutes, as we see more customs staff emerge to look at us and try and figure out what is happening. The situation has not been helped by a large sign informing us that Border Security will be at Tullamarine filming that day. Now I have to worry about a bad hair day on top of not having slept, and trying to get home 🙂 . The power did come on for about a minute, then went off dramatically, leaving us all in pitch darkness. Turning around, I noticed the doors to the duty free had been locked. We were pinned in between the Customs Desks and Duty Free, all several hundred of us. It is around this time Miss BG feels the need to go to the toilet. The staff are apologetic, but cannot let us through until we have been cleared. More officers come up, standing around in groups discussing the situation. An automated message is periodically broadcast stating the obvious loss of power, which really doesn’t help anyone’s mood. Our Customs Officer suggests we may feel more comfortable sitting down, but we reassure her that after 24 hours of sitting down, we really don’t want to do that. Periodically we get an announcement from a senior officer letting us know that they are trying to work out what the matter is. The crowd is somewhat restless,particularly the younger children, who sense the adults stress and begin to cry. I am feeling a touch light headed from lack of sleep, but the usual grumpiness which accompanies my lack of sleep has been replaced by an almost euphoric sense of calm. It could also have been the mouthful of Mars Bar which we shared between the four of us that restored my energy levels 🙂 . Regardless of lack of facilities, we are in the safest place. The baggage collection area is in total darkness and both Mr BG and I agree from a risk management perspective and an OHS perspective, we are better here. However, it is apparent that there is no real emergency procedure in place to process people manually through Customs, or the procedures haven’t been reviewed for a long time. Finally, they get a handle on what needs to be done. Quarantine officers move through the crowd and begin to initial people’s quarantine cards. Our Customs Officer, having been briefed, does the same and once again checks our faces at against the passport photos. The lights begin to come on, but not all of the airport has been restored. But we are through Customs! Heading down to the Baggage Collection, we see part of the hall is illuminated. There are people milling around, looking lost and trying to find their luggage. Carousel 1 has a few bags, not ours unfortunately. Then my last remaining functioning brain cells remember that our carousel was number 6. I take Miss BG with me and tell the boys to stay with the carry on luggage. With any luck, the plane’s cargo would have been unloaded before the power cut. We troop off into the dark and come across a few people whom we recognise from the flight. I ask if this is the luggage from our flight, glumly they say yes; sadly they have to wait until the power comes on to get theirs. I start hunting, checking all the red suitcases. One, two, three cases and Mr BG’s guitar have made it off the plane and are available! They are all loaded onto a trolley and we push them over to Mr BG. He is as estactic as one can be after 48 hours with minimal sleep. We push on through to Quarantine, who wave us through into the Arrivals Hall. We are greeted with a sea of faces who look expectantly at us, then register their disappointment when we’re not their relative. Undeterred we push on and debate toilets or finding our shuttle bus? It is at this point Mum and Dad pop up and surprise us all. Truly they are a sight for sore eyes! We gladly pass the kids over to them to take back to Ballarat, while we take the luggage with us to the bus home. Mr BG and I look at each other. ‘Really, really good,’ we say.